There was no clear cut winner in my quest to put the title of the new collection to a vote, so I've decided to go with one of my favorites. 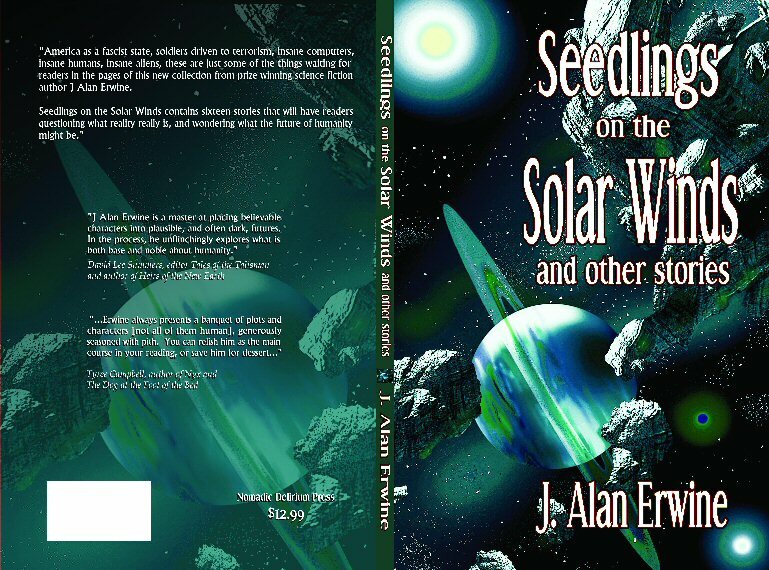 The title will be Seedlings on the Solar Winds and other stories. I think it fits me and my writing pretty well. Almost all of the responses I've gotten back about naming my new collection have said that I should use the title of one of the stories. So, I thought I'd open it up for voting and debate on my blogs and on my LJ account. No guarantee that I'll use the winning title, but I would like to hear what people think is catchy, because let's face it, I want to sell books! Still talking about the new collection here. We've been discussing cover art with the artist, Laura Givens, who will be doing the new cover. Laura did the cover for The Opium of the People, and she had a suggestion for the new cover. In the past, I've done some "modeling" for her, and she suggested using something with me for the cover. In some ways, I liked this idea, especially with the way she presented it, but at the same time, it seems like the height of arrogance to put yourself on the cover of your own book! What do you think. I've also been looking at her space art, and I really love it, and I'm thinking I might want to use something like that. You can check out her work at http://www.lauragivens-artist.com/. I'm working on putting together a new short story collection, and I've been thinking a lot about titles. My first two collections were Lowering One's Self Before Fate, and other stories and Marionettes on the Moon, and other stories. In both cases, I used one of the stories in the collection as the main title, but I'm not sure if I want to go that route this time. So, I thought I'd throw it out for discussion, what sounds better to a reader...a title incorporating one of the stories, something that tries to sum up the theme (although there really isn't one), or something a little more random. From now until Christmas, NDP has reduced the price on The Opium of the People and Marionettes on the Moon. You can get one for $9.99 and the other for $5.95...and even better, there's no shipping & handling on either title! Fellow author and rationalist John Scalzi recently paid a visit to the newly opened Creation Museum. He has an extremely detailed report about it on his blog. Click on the title of this entry to check it out. In reading through his report, I have to admit that I think I'd be on the ground laughing before I was finished with the second room. Some of the things these people are trying to push on people as science are a joke. For example, there were dinosaurs in the Garden of Eden and they were all herbivores before Adam ate of the apple. I just have this image of Adam and Even with their fig leafs chilling with a T-Rex. Absurd. It's a great post from John, however, and he tries to examine the "museum" with as open of a mind as he could possibly have. The door creaks open slowly as you turn the key, knowing that what you don't want to see is there. You take a deep breath as you reach in, hand trembling slightly. Suddenly, breath held in terror, you pull out that which you feared. It's a manila envelope, and it feels thick. Your story is back with a rejection. All of us have felt this at one time or another...some of us have experienced it so many times, we're now immune to the feeling. So, what do you do? What you don't do is write the editor telling him or her how you feel about them and their entire lineage. That's a sure-fire way to get yourself black-balled from that publication, and possibly many others. Remember, a lot of editors know a lot of other editors! The only thing you really can do is read the rejection letter, take what you can from it, make any changes to the story you need to, and send it back out. Then, you sit back and wait for the cold sweat to return again as you wait for the next time you're going to stick your hand in that mailbox. Something that's very important to remember is that editors aren't evil demons sitting behind a desk waiting to reject you, your story, and your progeny (at least, most of them aren't.) An editor is just a person whose doing a job that they hopefully enjoy. Their main goal is to put out a quality product, and as such, they can be your best friend...or at least someone who can help you. One thing many authors fear is the cover letter. When you write the cover letter, the most important thing is to let a bit of your personality show through. Don't send a letter that sounds as stale as last month's bread. Your cover letter reflects your abilities as a writer, and some publishers don't get past the cover letter. If you don't grab them right away, get ready for rejection. By the same token, don't try to oversell the story. Don't tell the editor that the story they're about to read is the greatest masterpiece since Hemingway. Nobody likes a braggart, and if you're like 99.999% of the writers out there, your story will not be better than Hemingway. Give a simple sentence on what the story is about, and why you wrote it, but like I said earlier, let your personality show through. If you don't have one, go to a costume shop and rent one. The biggest fear of any writer, and you won't realize this until it happens to you, comes about when your wonderful story comes out, and it's been completely butchered by the editor. I speak from personal experience as one of, what I consider my best stories, had this very thing happen to it. There were numerous typos, and even two paragraphs left out. They weren't necessarily important paragraphs...it was only the climax of the story. What do you do when this happens? Rant and rave, but don't kick the cat or dog...they will get even! Then, you sit down and write a polite letter to the editor. Keep all the anger inside because it's not going to help any. If they don't do anything to correct the problem to your satisfaction, don't ever submit to that publisher again. In my case, the publication folded before they put out another issue. I'd like to say that I didn't take joy in that, but I'm only human. I could go on about avoiding ghoulish publishers, but maybe that will be for another issue. For now, remember that as an aspiring author, you're going to encounter more tricks than treats early on, but once you start receiving those treats, they're better than anything you can imagine. I recently joined a site called Goodreads.com. It's a site for readers and authors both. I, of course, signed up as an author. If you want to check out their website, you can find it at http://www.goodreads.com. It doesn't seem anywhere as annoying as MySpace, so you don't have to be worried about that. If you do join, please feel free to add me by going to my profile. In other news, I've just finished seven straight days at the place worse than hell. I'm looking forward to a couple of days off!!! I was recently asked to contribute a story to a science fiction pirate anthology. This is a new type of venture for me. I've written stories about criminals in the past, but never pirates. I've never really given much thought to space pirates. I've always thought of it as a possibility, but I've never thought of it as something I'd want to write about. I've just typed the last word, "water," in the rough draft of the new novel. The book came out much shorter than I'd hoped, mostly because I deleted an entire section halfway through. It just didn't fit with the rest of the novel. I have, however, come up with a new sub-plot that I'll introduce. I just haven't decided yet if I'm going to go back and put it in this draft, or just work it into the second draft. That plus adding in all of the description that I tended to leave out should give me the word length I need. All I know is that I'm happy to be done! Now I'll take a break from the manuscript for a few weeks, and attack it with a fresh perspective later. I mailed in my ballot for this year's election today. Democracy in action! Granted, I live in a very small town, and there were actually only two things on the ballot, but I voted nevertheless. Voting is the most important thing we as Americans can do, and so I've done my part. MileHiCon artist guest of honor and crazy man Frank Wu has been combining the LOL cats with Star Trek on his LiveJournal. If you click on the title of this entry, it will take you over to his journal. You can scroll through his entries and read them. Some of them are hilarious. If you've never watched Star Trek, you won't get them, but since there are so many SF geeks and cat freaks who read this blog, I thought I'd pass it along. I've spent the last few days trying to get caught up. I went back to work on Tuesday, and we were very busy. Today I had to finish the Sam's Dot update, which is now up, and I've been trying to get everything else done that I need to get done. I've done a little writing, but not as much as I'd like.